Window. 1901-2. stained and leaded glass, bronze, wood. George De Feure, known as "the poet of the poster", lived from 1868 to 1943 and was a prolific artist of the Art Nouveau style. He was born in Belgium and worked mostly in France. He created his art and designs through a variety of media: painting, furniture, glass windows, pottery, carpet and jewelery. He also did work as a set designer and interior designer. 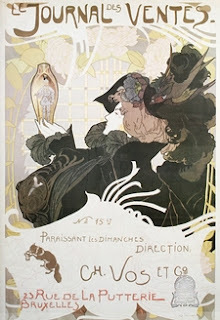 At VMFA there are many great artworks in the Art Nouveau gallery. 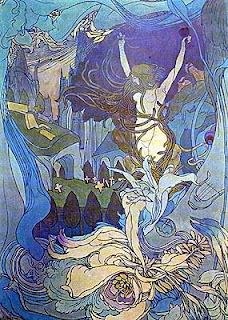 Two works I got pictures of by George De Feure were a poster and a stained glass window of his design. His designs are very elegant and often depict women in stylish gowns. I love the graceful forms and classy females of George De Feure's designs. I'll probably use some of his posters as inspiration for the Graphic Design course next semester. Poster, Isita. ca. 1900. Lithograph. George de Feure. Door of Dreams. Paul Ranson. Embroidered by Laure Lacombe. Louis Chalon and Eugene Feuillatre.